From Custer, SD, head west on US Highway 16 to Newcastle, WY. Pick up Rt 85 heading north out of Newcastle and continue until you cross back into SD and reach the town of Cheyenne Crossing, SD. Here is where you want to turn left on Rt 14A North which is the Spearfish Canyon Scenic Byway. It is clearly marked and hard to miss this turn. Follow through to Spearfish, SD then turn left, or west, on Main Street which turns into US Highway 85 North again as you leave the town and cross over I-90. Follow US Highway 85 to Rt 34 west which turns into Rt 24 once you cross into WY (without making any turns). When you reach Hulett, WY, continue with Rt 24 heading south. 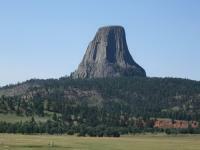 Travel another 10 miles to Devils Tower. After Devils Tower, go south on Rt 24 to US Highway 14 heading to the endpoint of Sundance, WY. Heading west on Rt 16 from Custer, SD to Newcastle, WY is hill country with tall pines and rocky outcroppings. As you approach Spearfish, SD, you'll travel the Spearfish Canyon Road which is one sweeping curve after another with high bluffs covered in pines. Rt 24 from Belle Fourche, SD to Hulett, WY is quite flat and not very scenic, but the road has some hills and curves. Road quality is good with the exception of a 10 mile stretch or so on Rt 24 west of Aladdin, WY. The road was being oiled and pea gravel was being laid. This was being done in August of '08. No issues with gas as most every town along the way had a gas station. It'll be best to gas up at Spearfish, WY or Belle Fourche, WY. RT 24 is sparse with stopping points. The larger towns along the way have plenty to offer if you need to stop and rest. on August 3, 2014 1 out of 1 members found this review useful. I rode a variation of this route - Custer to Lead up 16/385. Went through Spearfish Canyon from the south - a really great ride through the canyon. Then Spearfish to Hulett on WY 24 and on to the tower - very scenic, easy ride. Came back via US14 to I90 east. We rode a variation of this ride Aug 2009, spearfish canyon is really nice, would have been better without so much traffic. Hulett is a nice little town and the Hulett Motel is a reasonable and clean place to stay. We did find on Sundays gas was available by credit card only in some of the smaller towns. The ride north from Hulett up to 212 is nice and there is a great little bar in Alazda that sells bottled water along with the standard bar fair and has wonderful rest rooms. on July 28, 2009 0 out of 0 members found this review useful. I was traveling south on Rt 24 from Hulett. Didn't do any camping on the trip. Post your experience when you return. on April 26, 2009 0 out of 0 members found this review useful. nice shots of devil's tower. from what vantage point. I'd guess from the SSE ? Any recs for camping around there? I heard the the KOA there was nice. Going to be there in Early June.